According to the U.S. Department of Commerce Weather Bureau, Chicago's average annual snowfall is 33" and rarely exceeds 40". Since records began to be kept in 1899, there have only been four winters in which total snowfall exceeded 60". But during the winter of 1978-79, the total was a staggering 88.4"! And by the end of January, there was an accumulation of more than 47" on the ground, most of which was compacted ice! The Blizzard of 1979 started on Friday night January 12 and lasted until 2 a.m. Sunday January 14. On top of 7-10 inches left over from a New Year's Eve storm, 20.3 inches of new snow fell--setting a record for total snow on the ground. Transportation came to a standstill for several days. 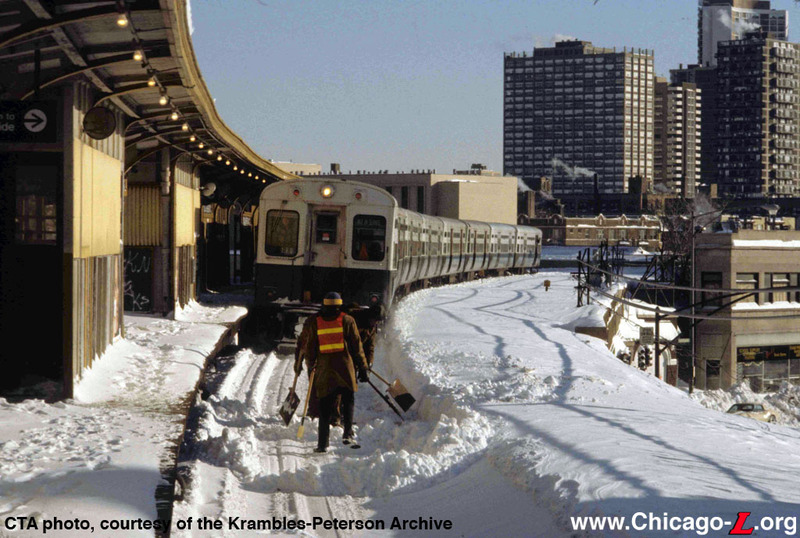 The CTA had snowfighting equipment, mostly cars fitted with small snowplows suitable for the 8"-12" of snow that usually falls at any one time. But it soon became apparent that these were inadequate against the 27" of snow on the ground and so the shops manufactured makeshift plows of heavy plywood laid in cross-grained layers of up to 6". 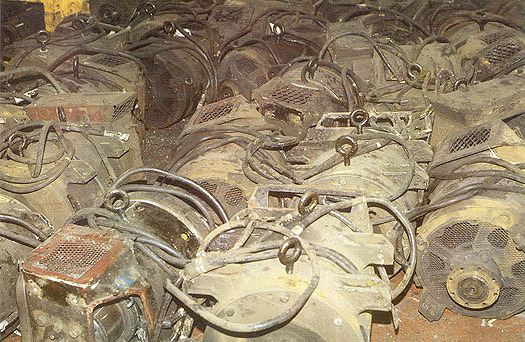 The use of wood instead of steel kept the plows insulated against the 600 volt DC third rail. 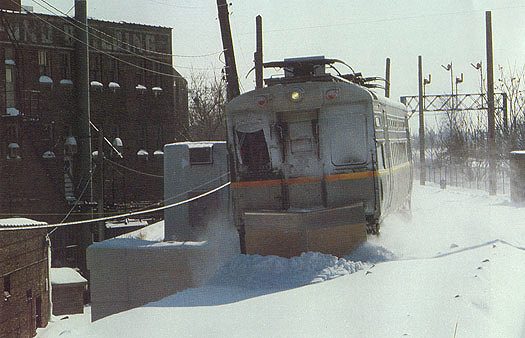 The plows were attached to the front of married-pair units, using both designated work cars and revenue units from the passenger fleet. they too were disabled. By January 29th, more than half the 890 cars needed to maintain normal rush hour service were disabled and unusable. With capacity down and ridership up from foul-weather fans who found the roads impassable, overcrowding was severe. Trains were delayed by passengers forcing their way into crush-capacity cars, causing longer-than-normal station dwell times. People rode outside between cars or on the ends of trains in the subzero weather. People even jumped on and off moving express trains to get to their stop! On the Dan Ryan Line, trains were at full capacity from the start at 95th Street and stopping the trains at intermediate stations only worsened the delay and compounded the problem. A trip downtown that normally only took 10 minutes was now taking 30 to 40 minutes. Several alternatives for how to deal with this problem were discussed. One option was to simply suspend all service until snow removal could be completed. 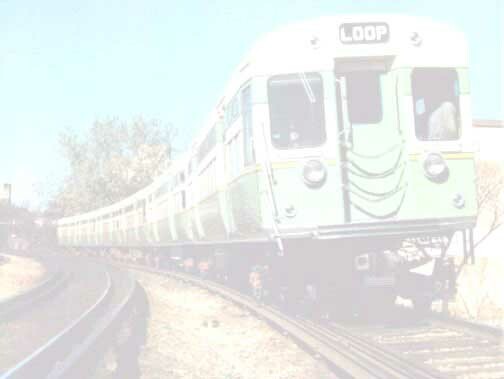 The sections that operated on elevated trestles - the Loop, the Englewood-Jackson Park, most of the Ravenswood, the Howard south of Wilson, the Douglas east of Pulaski - had few problems since snow could fall through the tracks and structure to the ground below, but those that ran on the ground or on solid-fill embankments - the Howard north of Wilson, the Evanston, the Skokie Swift, the outer portions of the Ravenswood, Douglas, O'Hare, and Lake Lines, the Dan Ryan and Congress Lines - fought an ongoing battle with the elements. Shutting down would have resulted in a loss of revenues and ridership, but would have saved a lot of hard work and equipment damage. But the alternative selected was to run limited express service during rush hour to save time, speed up service, and serve the most passengers possible with the limited equipment available. The Lake-Dan Ryan was chosen for this since it had the most number of alternative paralleling transit and bus lines within walking distance. Tuesday, January 30th: Trains operated express between 69th and Adams/Wabash on the Dan Ryan and Clinton and Austin on the Lake between 0600-1000 hours and 1430-1830 hours. At all other times, trains run normal local service. Wednesday, January 31st: Maintenance personnel report a gain of 10 cars, allowing revised express service in the PM rush. Trains run express from 69th to Sox-35th then to Adams/Wabash and from Clinton to Cicero from 0600-0930 leaving 95th Street or Harlem and 1530-1830 leaving the Loop. Local service at all other times. Thursday, February 1st: With another 10 cars back in service, service is again revised in the PM rush. Trains are operated express from 63rd to Sox-35th then to Adams/Wabash and from Clinton to Pulaski from 0600-0900 and 1530-1830. Local service at all other times. Friday, February 2nd: Rush hour express service the same as previous day. All stops restored effective 1830 hours. The measure proved effective in restoring control and making service productive again, though some commuters were undeniably shafted. In only four days, the system had been restored enough to reestablish local service. During the storm, the CTA released constant status updates to the media. Staffing was doubled in the transit travel center to provide up-to-date information to the hordes of callers that flooded the CTA's customer service lines. Office personnel were reassigned to station platforms to similarly help riders and direct crowds. The poor weather continued for months. During January, the temperature went above freezing on only three days and then only for a few hours. On the 14th and 15th, a record-setting temperature of -19 degrees F occurred. February was bitter cold and had no temperatures above freezing until the 20th. Thawing weather didn't arrive until March 18th! Service was paralyzed when the snow first hit. On January 13th, snow depth up to the motors stopped service on the Skokie Swift, Evanston and outer Ravenswood, Congress, Douglas, Lake, and North-South Routes. Not until the 18th was enough snow cleared to store at least some service on all lines. But periodic snow falls continued to stop service on many lines for intermittent periods of time. 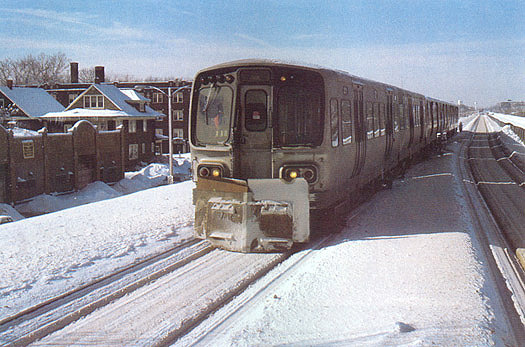 The Skokie Swift was the hardest hit, with all service suspended from January 13th to the 18th, then again for three days from the 24th to the 27th. The disruption of the transit system (and many other city services) caused much criticism and finger-pointing. Much of the controversy surrounded the suspension of service to inner-city stations. Popular wisdom attributes the February 27 electoral defeat of Mayor Bilandic to the difficulties the city had in dealing with the storm.